The landscape of the American family has changed dramatically in recent decades. In the wake of these changes, a new Pew Research Center report looks at the challenges parents face in raising their children and how parenting approaches differ across demographic groups. 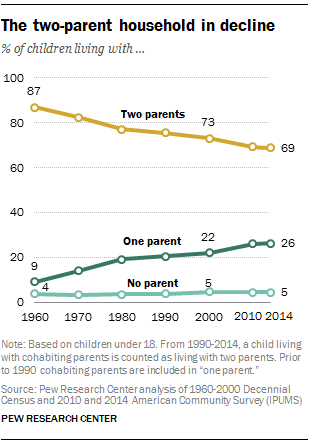 1 A declining share of children live in two-parent households. Today, 69% of children younger than 18 are living with two parents, down from 87% in 1960. A record-low 62% of children live with two married parents, while 7% live with two cohabiting parents. Meanwhile, the share of children living in single-parent households has increased threefold, from 9% in 1960 to 26% in 2014. The rising prevalence of divorce, remarriage and cohabitation has caused other changes in family living arrangements, even among those living in two-parent households. In 2014, fewer than half of children (46%) lived in a household with two married parents in their first marriage, down from 73% in 1960. 2About half of American parents say they are doing a very good job raising their kids. Mothers are more likely to say this than fathers (51% vs. 39%). And moms in younger generations are particularly likely to give themselves high marks: 57% of Millennial moms say they are doing a very good job raising their kids, compared with 48% of Gen X and 41% of Baby Boomer moms, and 43% of Millennial dads. Parents care a lot about how others – in their immediate family and beyond – see their parenting skills. Roughly nine-in-ten parents who are married or cohabiting (93%) say it matters a lot that their spouse or partner sees them as a good parent, and 72% of those with a living parent want their own parents to think they’re doing a good job raising their kids. Smaller but substantive shares also care a lot that their friends (52%) and people in their community (45%) see them as good parents. 3 Bullying and mental health are among the top concerns for parents, but some parental worries differ sharply by income, race and ethnicity. Six-in-ten parents say they worry that their children might be bullied at some point. At least half also worry that their children might struggle with anxiety or depression (54%) or that their child could be kidnapped (50%). Parental concerns vary considerably across income groups. 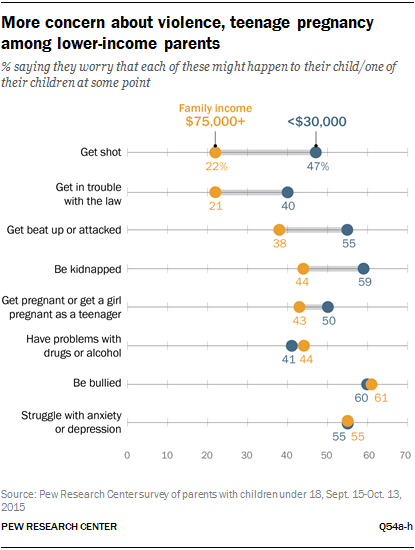 In particular, lower-income parents tend to be more concerned about their kids’ personal safety and teenage pregnancy than parents with higher incomes. For the most part, concerns don’t vary widely between black and white parents, but there are significant differences on three of the eight items tested. White parents are more likely than black parents to say they worry that their children might struggle with anxiety or depression (58% vs. 35%) or that they could have problems with drugs or alcohol (40% vs. 23%). Black parents, in turn, are about twice as likely as white parents to say they worry that their child could get shot at some point (39% vs. 22%). Hispanics are more likely than black and whites to say they worry about each of the items asked in the survey. These differences are driven, at least in part, by high levels of concern among foreign-born Hispanics. 4 Many parents struggle to find high-quality, affordable child care or after-school activities or programs. 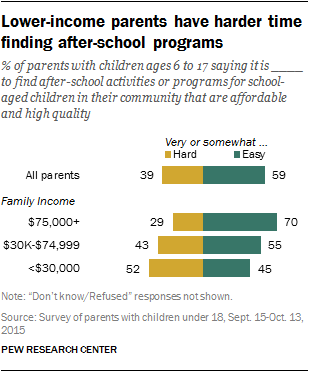 About four-in-ten parents with school-aged children (39%) say it’s hard to find high-quality, affordable after-school activities and programs for their children in their community, and this is especially the case for lower-income parents. These differences are also reflected in children’s participation in extracurricular activities: Parents with higher family incomes are more likely than those with lower incomes to say their school-aged children participate in a series of activities after school or on the weekends, including sports and music, dance or art lessons. Across all income groups, majorities of parents with children under 6 years old say it’s hard to find high-quality, affordable child care in their community. 5 A narrow majority of American parents say parents could never be too involved in a child’s education, but about four-in-ten say too much involvement could be a bad thing. Parents with family incomes of $75,000 or higher are more than twice as likely as parents with incomes below $30,000 to say that too much parental involvement in education could be a bad thing (59% vs. 23%). Parents with at least a bachelor’s degree are also more likely to say this than parents with lower levels of education. When it comes to parents’ own involvement in their child’s education, 46% of those with school-aged children say they wish they could be doing more, while slightly more (53%) say they are satisfied with the way things are. There are no clear links between parents’ income or education and views of their own involvement in their child’s education. However, black parents (58%) are more likely than white and Hispanic parents (43% and 41%, respectively) to say they wish they could be doing more when it comes to their child’s education.